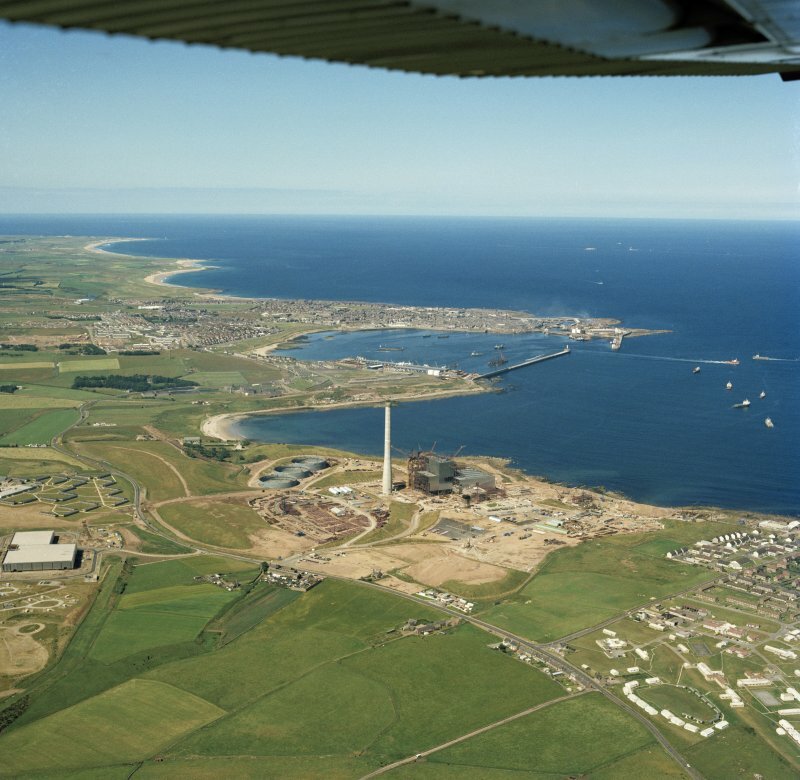 Oblique aerial view of Peterhead Power Station under construction. The 'Harbour of Refuge' that is often mentioned at Peterhead is to be equated with the enclosed expanse of Peterhead Bay. This extensive area of water is protected by massive artifiucial breakwaters, offers good anchorage conditions, and has no quayage or other discharge facilitities. 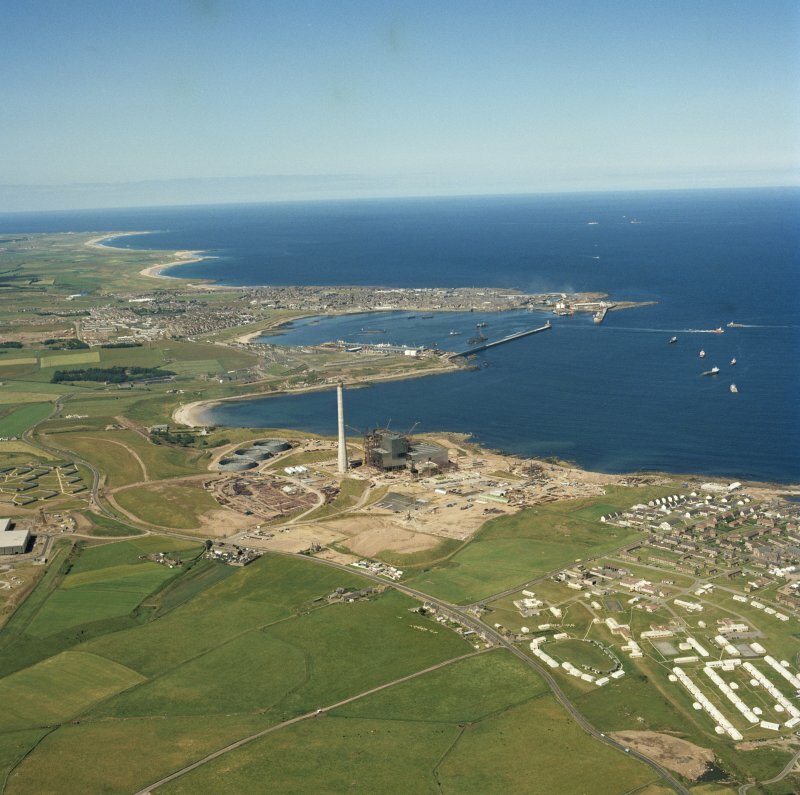 This harbour, an area of approximately 300 acres in Peterhead bay, is enclosed by two breakwaters. The north breakwater, constructed 1912–56, is approximately 1500 ft long. It is founded on levelled rock and constructed of 40 ton precast concrete blocks laid in horizontal courses. The south breakwater, constructed from 1892–1912, is approximately 2700 ft long. It is of similar construction but was founded on a shallow tipped stone mound. Convict labour from nearby Peterhead prison was used as direct labour during construction. season. This did not prevent damage to partially constructed work and, in thewinter of 1928, a stormdisplaced a 34 ft long section of wall by 2 in. It was calculated that a force of 2 tons sq. ft was necessary to cause the displacement. The engineer for the project was Sir John Coode.